Federal prosecutors have filed charges against the 28-year-old New Jersey man suspected of planting bombs in New York City and New Jersey, including using a weapon of mass destruction and bombing public places, according to a criminal complaint unsealed at a federal court in Manhattan Tuesday. Championing jihad, bombing suspect Ahmad Khan Rahami vowed to martyr himself rather than be caught after setting off explosives, and he'd hoped in a handwritten journal that "the sounds of bombs will be heard in the streets," authorities said as they filed federal charges. In the complaint, the FBI says a social media account connected to Rahami lists among favorites two jihadist videos. It also says that two days before the New York bombings, a video was recorded on a cellphone belonging to a member of his family showing him "igniting incendiary material in a cylindrical container" in a backyard at or near the family's Elizabeth, New Jersey home. According to the court complaint, Rahami's journal included a passage that said: "You (USA Government) continue your (unintelligible) slaught(er)" against the mujahideen, or holy warriors, "be it Afghanistan, Iraq, Sham (Syria), Palestine ... ."
Accused New York and New Jersey bomber Ahmad Rahami appears to have acted alone, the head of the FBI's Newark office said on Tuesday. In an exclusive interview with NBC New York chief investigative reporter Jonathan Dienst, Special Agent in Charge Timothy Gallagher also said law enforcement investigated Rahami in 2014 and found no evidence to suggest a tie to terrorism. Jonathan Dienst reports. Another portion expressed concern at the prospect of being caught before being able to carry out a suicide attack and the desire to be a martyr, the complaint said. It added that another part included a reference, on a page that is largely unintelligible, to "pipe bombs" and a "pressure cooker bomb," and declared: "In the streets they plan to run a mile." One official earlier described the notebook to NBC News as a "a hodge podge, a rambling, disconnected, choppy series of references to past events." There were also laudatory references to Osama bin Laden, Anwar al-Awlaki - the American-born Muslim cleric who was killed in a 2011 drone strike and whose preaching has inspired other acts of violence - and Nidal Hasan, the former Army officer who went on a deadly shooting rampage in 2009 at Fort Hood, Texas, the complaint said. Rahami was captured Monday in Linden, New Jersey, following a shootout with police that left two local officers wounded. He's separately facing five counts of attempted murder of a law enforcement officer in connection with the shootout, the Union County prosecutor said Monday. Rahami, who was shot 10 times, remains hospitalized after undergoing surgery. It wasn't clear if he had retained an attorney, nor was it known when he would be arraigned on the charges. Mohammad Rahami says he had no idea what his son Ahmad was allegedly up to. Tracie Potts reports. 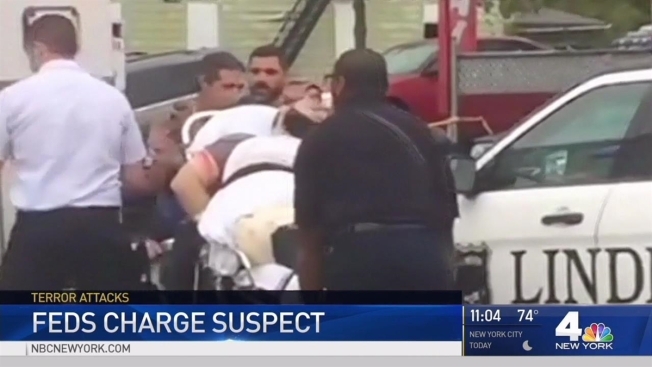 Federal agents have attempted to question Rahami in the hospital, The Associated Press reports. But Rep. Tom MacArthur, R-N.J., who received a classified briefing from the FBI, said Rahami was not cooperating. Rahami allegedly built four explosive devices, federal investigators said Tuesday. They allege he planted two pressure cooker bombs in New York City: The one on 23rd Street that exploded, injuring more than 30 people and spraying debris and glass into the street, and the one on 27th Street that didn't. Rahami also allegedly put a device made of three pipe bombs in a trash bin along a Marine 5k race route in Seaside Park. Authorities had said they believed the device was timed to go off as participants ran by the bin, but the race was running late. It was canceled, and no one was hurt. Federal investigators say Rahami also allegedly built a multi-part device that was found at a commuter rail station in Elizabeth, New Jersey, late Sunday prompting a series of transit disruptions. A robot trying to disarm the device inadvertently detonated one of the bombs, but no one was injured. Officials have said there is no indication Rahami was connected to any local or foreign terror cell, and they believe he acted alone. No other suspects are being sought in relation to the bombings, officials have said. 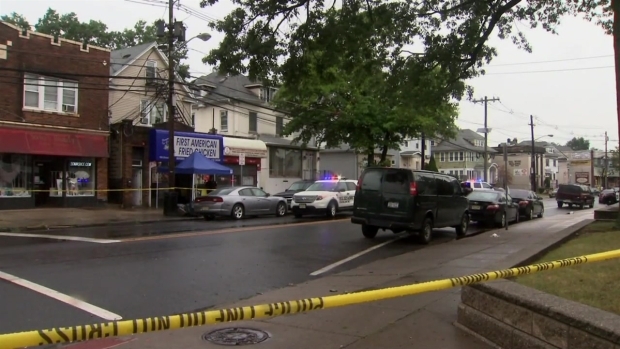 In an exclusive interview with NBC 4 Tuesday, the head of FBI's Newark office said law enforcement investigated Rahami in 2014 and found no evidence to suggest a tie to terrorism. 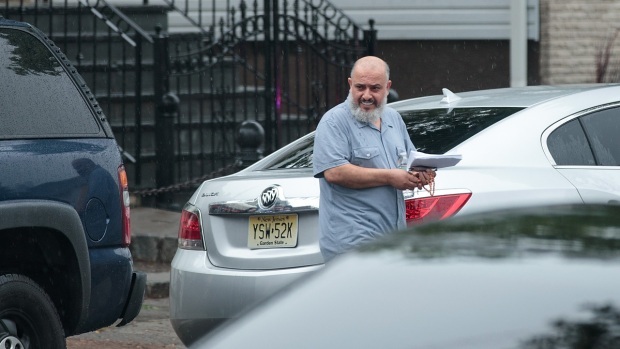 The court complaint describes Rahami buying bomb-making equipment so openly that he ordered citric acid, ball bearings and electronic igniters on eBay and had them delivered to a Perth Amboy, New Jersey business where he worked until earlier this month. San Jose, California-based eBay Inc. noted that the products are legal and widely available and said the company had worked with law enforcement on the investigation. Using pressure cookers to house bombs was popularized years ago by Inspire magazine, an English-language online publication produced by an al-Qaeda affiliate and used by the brothers who bombed the Boston Marathon in 2013. They too were followers of al-Awlaki, the American-born al-Qaeda-linked cleric killed in a U.S. drone strike in 2011. Rahami worked as an unarmed night guard for two months in 2011 at an Associated Press administrative technology office in Cranbury, New Jersey, the wire service reports. At the time, he was employed by Summit Security, a private contractor. The remnants of a detonated bomb can yield major clues into who made the device. The I-Team's Pei-Sze Cheng reports.